The Continental Grand Prix 4000 S II tubular tire – does this tire even need an introduction? The “4000″, a multi award winner, has been a go to racing tire for such a long time it has become the standard other companies only compare to. How has it become such a staple choice of a competitive cyclist? An easy question to answer. By bringing together grip, quality, low cost, weight, flat protection, longevity, and low rolling resistance in a winning combination. Try naming another tire that meets all these characteristics and you will surely come up dry. It was research and innovation in Continental’s research labs that lead to the creation of this tire. Lets peel back the layers and take a look at what makes this tire a winner. Continental has been making bicycle tires since 1871 and to this day they are handmade in Germany. There is a high level of quality control and the company is always at the forefront of new tire technology. The Continental Grand Prix 4000 S II 4000 tubular tire uses the Vectran Breaker puncture protection layer. This is a silk like synthetic layer that is light weight, strong against cuts, and does not adversely affect rolling resistance like many puncture protection layers. This technology adds to the silk tubular like feel and is the reason the Continental Grand Prix 4000 S II has a supple feel and low rolling resistance. Another technology is the Black Chili Compound. This well known compound has been used on mountain bike and road tires since 2005. Combining low rolling resistance, puncture protection, and long tire life seemed like an impossible problem to solve. Traditionally a grippy and fast rolling race tire is synonymous with quick wear, and in turn a long lasting tire is thought to be slow rolling. The Black Chili Compound, which uses the latest polymers and mixing technology, became the solution to this dilemma. So when choosing a tubular tire, the Continental Grand Prix 4000 S II tubular tires are a perfect choice. The SoCalCycling.com Team has been using the Continental Grand Prix 4000 S II tubular and clincher tires with great success over the years. 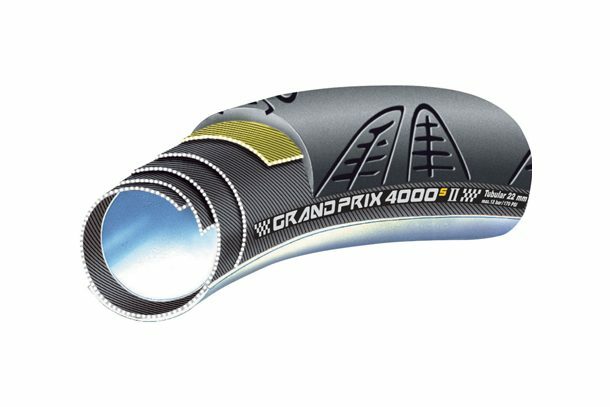 Continental Grand Prix 4000 S II Tubular Tires are available at Incycle.com.